This comes in various guises. Cut across into neat thick (2.5cm / 1 inch) slices, it becomes tournedos. A neat piece for 2-3 people, weighing perhaps 225g / 8 oz cut from the thick end (but with all the coarser meat trimmed from it), can be grilled, spitted or roasted as a chateaubriand. 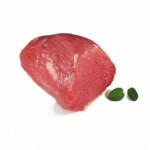 Medallions are thin neat slices cut across the fillet. 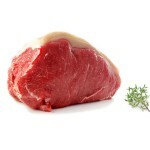 The name sirloin covers steak from the upper side of the true sirloin, wing rib and fore rib. 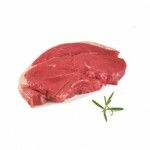 The French entrecte means only the true tender sirloin, which is cut in individual steaks or as T-bone steaks (on the rib, with the sirloin on one side of the T and the fillet or under cut on the other). French cte de boeuf or our rib of beef are thick steaks on the rib bone, from the slightly less tender wing rib or fore rib. Porterhouse is a double-sized T bone or double sized wing rib. Topside, silverside, brisket, thick flank. Chuck, shin, brisket, flank, neck, topside, silverside. 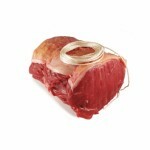 These cuts are also suitable for salting and boiling. Fillet, rump and sirloin. But the names for steaks can be confusing: Rump steaks: (rumsteck in French): these are thick (about 2 cm / 3/4 inch) slices cur across the grain of the rumps, and then, if for individual servings, cut into smaller, neater pieces. Chuck, brisket, thick flank, shin (foreleg), shin or leg (hind leg).